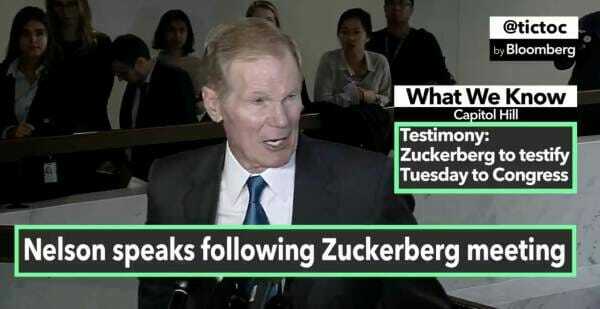 After meeting Mark Zuckerberg on Monday, Senator Bill Nelson (D-FL) warned online privacy will be a thing of the past for Americans unless social media giants like Facebook are monitored. Zuckerberg is scheduled to testify before a joint Senate Judiciary and Commerce Committee hearing on April 10th and the House Energy and Commerce Committee on the following day. Below is footage of Zuckerberg arriving on Capitol Hill Monday. A violation of the consent decree could carry a penalty of $40,000 per violation, which could mean a fine conservatively estimated to be “many millions of dollars in fines” for Facebook, The Washington Post reported over the weekend, citing a former FTC official. “We reject any suggestion of violation of the consent decree. We respected the privacy settings that people had in place. Privacy and data protections are fundamental to every decision we make,” the social network giant said in a statement to the Washington Post. The post Senator Warns After Zuckerberg Meeting: “No American Is Going To Have Any Privacy Anymore” Unless We Monitor Facebook (VIDEO) appeared first on The Gateway Pundit.